It's important that patients understand all of the risks and benefits of any eye care procedure that they undergo. This is particularly true with LASIK. While LASIK is one of the most popular and effective options for treating refractive errors, there are side effects to consider, and post-operative recovery can be uncomfortable for some patients. At Southwest Eye Care & Laser, we make sure that all patients throughout the greater Bakersfield area are given the information that they need to make smart choices about their vision and the overall health of their eyes. How common is discomfort after LASIK? Irritation and discomfort are common side effects after LASIK surgery is performed. This is a given simply considering the nature of the LASIK procedure. Thankfully the discomfort is manageable and only temporary, and there are a number of things that patients can do to address these issues as they arise. Healing begins before your LASIK surgery is even performed, which is why patients are given instructions on things to do and things to avoid both before and after surgery. Be sure to follow all instructions for care closely. This will help prevent complications and improve your overall healing time/experience. After undergoing LASIK, you will be given eye drops to use that will help alleviate discomfort and assist in the healing process. Be sure to use any medications that are provided as directed. Overuse of certain medicated eye drops can actually have an adverse effect on healing times, so be sure to use them when you need them rather than rely on them all the time. After undergoing LASIK, you will be given eye shields/goggles to wear for the first few days. 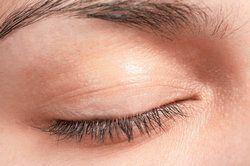 These will help prevent you from rubbing your eyes or accidentally touching your eyes as they heal in those crucial first few days. If you have any questions or concerns as you heal, be sure to speak with your surgeon at the practice. By contacting our team as issues or questions arise, you will be able to receive immediate care and information. This may be crucial for preventing complications or treating them before they become more severe. If you would like to learn more about LASIK surgery and how it can be of great benefit to you and your needs, be sure to contact our laser eye surgery centers today. Dr. Gregory Stainer and the entire team will be more than happy to go over all of your options for effective eye care in greater detail during your visit.